AFC Fylde manager Dave Challinor admits he is anxious to bring new bodies in ahead of the return to National League action against Wrexham on Saturday week. Latest loan signing Mason Bloomfield is back with parent club Norwich City after suffering a compound fracture to an arm just 23 minutes into his Coasters debut at Bromley on Saturday. In recent weeks, Fylde have also seen Gime Toure move on to Sutton United, while Jim Kellermann and Danny Williams have left the club after loan spells. Bloomfield has undergone surgery and is determined to return to Fylde before the season is out, though Challinor has an urgent need to replace the 22-year-old in the short term. Challinor said: “We were short anyway in terms of numbers and this makes us shorter. We need to bring bodies in. “We have been trying for a couple of weeks and we worked really hard to get Mason in for the rest of the season. He would have been a huge asset for us. “We have two weeks before the next league game but it’s about getting players of the right quality. The National League takes a break this Saturday, when Fylde welcome Bedfordshire club Biggleswade Town to Mill Farm in the second round of the FA Trophy. Full-back Luke Burke, injured in the 3-2 defeat at Bromley, is a major doubt and it is highly unlikely that midfielder Ryan Croasdale, who picked up a knock against Barrow on New Year’s Day, will be fit to return. Winger Ash Hemmings is cup-tied following his return from Altrincham, and Fylde continue to be cautious with Lewis Montrose as he feels his way back after a long injury lay-off. 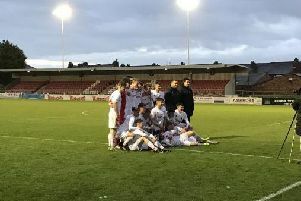 After defeating AFC Fylde last weekend, Bromley have done the Coasters a favour by defeating their National League promotion rivals Wrexham 2-0 in south London last night. It means that the Welsh club remain three points clear of fifth-placed Fylde but they no longer have a match in hand. Wrexham have slipped a spot to fourth, overtaken by a Solihull Moors side who won last night’s other National League fixture 2-1 in Gateshead.